Today’s special guest is Erin from The Spiffy Cookie. Erin and I go way back, well ok a few months. She was the winner of my Peanut Butter Lover’s Gift Pack! For a charity I bid and won her Lunch Ladies Peanut Butter Cookies, which my Husband ate! I’m still mad at him for that! I got 1 cookie out of the dozen! 🙁 Then Erins friend bid/won my Banana Bread with Chocolate Chips. It seems we keep connecting with each other. Did you know Erin/The Spiffy Cookie was where I was inspired to bake my pancakes? Thanks to Erin I love baking pancakes!! It opened up a whole new breakfast world for me! Today, Erin has a wonderful sweet treat to share with you, which I plan on making!!! Total yumminess!! Hi there! I typically answer to the name Erin, and blog over on The Spiffy Cookie. If we have never met before, let me tell you a little something about myself. I currently am a graduate student working towards my PhD in microbiology (hopefully done in a year!) and during my limited free time I blog about my food obsessions and adventures. I tend to dwell a lot on desserts, but you will find I eat real meals just as frequently. But for now, let’s stick to the dessert category. When it comes to this area I am absolutely obsessed with peanut butter, Funfetti cake batter, cookie dough, fruits, and pretty much anything that involves cream cheese. 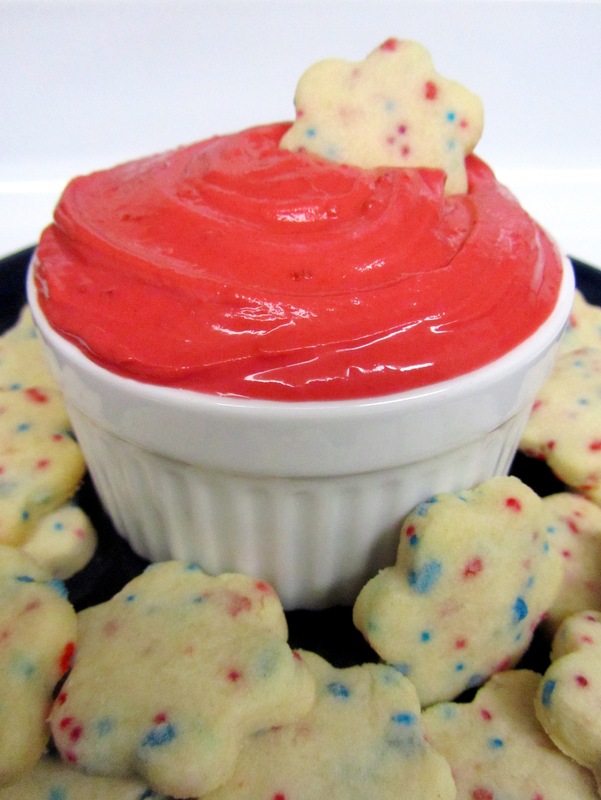 And it just so happens that one of the most popular recipes on The Spiffy Cookie is my Cake Batter Fruit Dip – which tastes like raw Funfetti cake batter and cream cheese is one of the ingredients. But I got to thinking the other day, why stop at Funfetti? There is a whole world of cake batters waiting to be turned into an egg-free dip. So I grabbed a box of Red Velvet and got to work. Even though cream cheese is amazing to me, I decided to make this dip a little healthier by using vanilla Greek yogurt instead of cream cheese and frozen whipped topping. I had to add a little bit of sugar from the absence of sweet ingredients but the end result was just as good. You really cannot go wrong with anything that tastes like raw cake batter! I even went ahead and made little shortbread cookies to dunk into the dip as well. Sweet upon sweet. I hope no one has any problem with that O:-). In a medium bowl, mix Greek yogurt, cake mix and 2 tablespoons of powdered sugar until well incorporated. If you prefer it to be sweeter add an additional tablespoon. Place in serving bowl and enjoy with shortbread or your favorite fruits! I know, I can’t wait to try it!!! It should be a rule that dip has to taste like cake batter!! Yum! Red Velvet is one of my favorite cake flavors, I never thought of it as a dip, great idea!! Don’t you love it!! I have to try it myself! I went to your website from this picture and just let me say, AMAZING! I have been looking for recipes to cook for me and my husband and its been difficult because were newly weds. Haha but I was even more amazed to see that all your stuff was low fat which is even funnier because Ive been trying to lose weight!! So again thank you! Saw the picture at Erin’s blog and had to pop over for the recipe, yum!! And how cute are those little cookies?! OK, seriously? This looks too good. GET IN MY BELLY! I know it sounds amazing!!!!!!!!!!!!!!!!!! I love this. oh so much! Does it haveta be red velvet cake mix? im not too crazy abt red velvet cake. This looks great…can’t wait to try it! I can’t wait to try it too!! Maybe Im reading something wrong but in her post it says its made with frozen whip topping but I dont see that mentioned in the recipe. Am I missing something? Thank you!! Looks delicious!! She used greek yogurt for this dip, but in the past recipe she would use cream cheese and whip topping. what kind of cookie is that?? do you mind sharing, thanks!! How long can you store it? If you make a batch how long will it stay fresh? where should you tore it? Would like to have the cookie recipe to! !